November 6th 2017 marks the 800th anniversary of the Charter of the Forest and to mark it, The Woodland Trust have teamed up with over 70 organisations to launch a Tree Charter for trees, woods and people. The Trust wish for the tree charter to gain its strength from the hundreds of thousands of people who sign it. Protecting trees is more crucial than ever since there are increasing threats, all of them made graver by austerity policies: infrastructure development (particularly if it is poorly designed with corners cut), pollution and climate change, pests and diseases (such as ash die-back), lack of protection in planning policy (the UK has just 2% ancient woodland cover, yet more than 500 ancient woods are under threat), decline in wildlife diversity (60% of species are in decline in the UK), decline in enrolments in forestry careers and awareness of forestry, no replacement of large ancient trees (especially in cities). In fact, not enough trees are being planted to replace those being lost each year. Trees benefit us in so many ways. They provide: clean air, natural flood defences, noise dissipation, improved physical and mental health well-being, cooling for urban areas, pollution absorption, wildlife habitat, recreational spaces, contact with nature and sensory outdoor learning resources. But it is not just about trees as physical elements in the landscape. The charter of the forest was an attempt to put into statute and re-assert ancient rights to common resources which had been eroded by William the conqueror and his successors, complementing the judicial rights granted in the Magna Carta two years previously. The charter provided some economic protections for commoners. It included rights to graze farmed animals, forage, produce charcoal, make fish ponds and mills, and source firewood and peat from ‘forests’ which could include fields and heathlands as well as forested areas. Of course, as with any advancement or re-affirmation of human rights, this wasn’t just one event in time, but was the result of many years of political struggle by the commoners of these and other lands. The theft of enclosure ultimately provided the early industrialists with both the land to build their factories on and the landless working classes to work in them. A continuing economic separation of people and land is a driving force of our industrialised world and has led to a decline in understanding of the natural world. Directing the economy away from an everyday engagement with living resources has served to devalue nature to the point where being in nature is rarely essential for one’s survival. We are the only species about which this could be said. Engagement with nature should not be seen as just a nice retreat, but a necessity, as otherwise people are unlikely to be fully motivated to protect nature. To best protect trees and the natural world, we must transition to an economic system powered by living nature and not fossil fuels. But we can make a start on re-engaging with nature by signing up to the tree charter, which believes in: Thriving habitats for diverse species; Planting for the future; Celebrating the cultural impact of trees; A thriving forestry sector that delivers for the UK; Better protection for important trees and woods; Enhancing new developments with trees; Understanding and using the natural health benefits of trees; Access to trees for everyone; Addressing threats to woods and trees through good management; Strengthening landscapes with woods and trees. 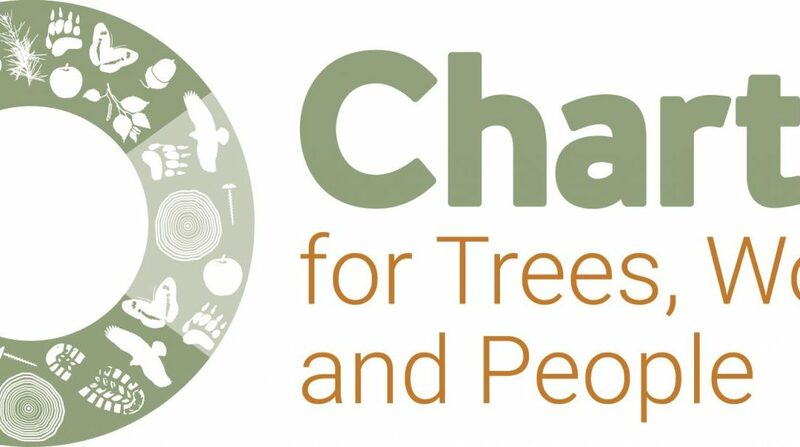 So sign the tree charter at https://treecharter.uk/ and perhaps plant a tree yourself this autumn.